Chipmunks are rodents that resemble squirrels. 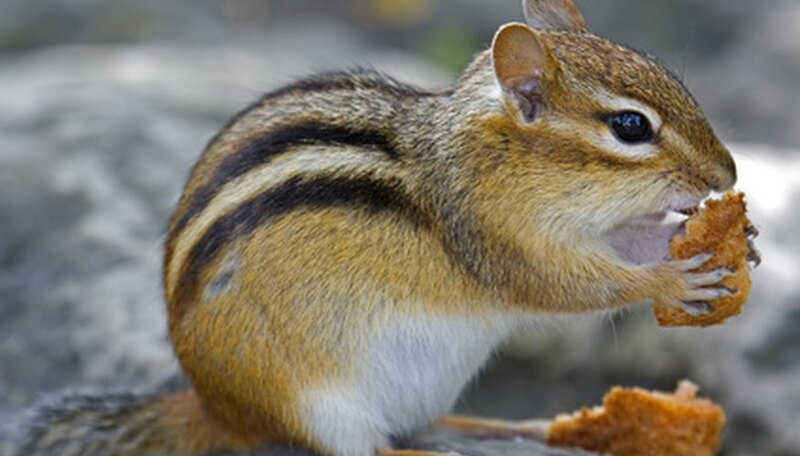 Unlike squirrels, however, chipmunks have stripes down their backs. Chipmunks can be fun to observe unless they are causing destruction to your flowers. Chipmunks will often dig near flowers to find worms to eat. They will also munch on any flowers that have seeds. This will destroy your flowers. Fortunately, there is something you can do to stop the chipmunks from eating the flowers. Place a clove of garlic, a jalapeno pepper and a pint water in your blender. Blend until the ingredients look like a puree. Strain the ingredients from the blender with a piece of cheesecloth. This will remove any small bits of garlic or pepper that could potentially clog your spray bottle. Pour the strained liquid into your spray bottle and add the vegetable oil. The vegetable oil will act as a binding agent. It will keep the homemade chipmunk repellent stuck to the flowers. Spray your flowers with this mixture. It will not hurt the flowers but will keep chipmunks away. You will need to repeat the spray every two weeks, or after a heavy rainfall. You can always try to trap the chipmunks, but you can never be sure you'll get all of them. It is better to just protect your flowers. Do not use mothballs to get rid of your chipmunks. Mothballs are highly poisonous to any outdoor animal, including your pets. They are even toxic to humans.